Home | daisy is crafty! | I won my Knitting Olympics! Well, all I can say at this moment is, I am so proud. I was not quite sure I would make it. Seriously. This was really hard for me. I didn’t get to start during opening ceremonies. I went out to dinner. I tried two ways of knitting these socks, two sets of circular needles, and then a set of 40” addie turbos that I bought at Stitches West last weekend. The 40” magic loop method really did work best for me. I had trouble measuring, and the sock I made for the left foot (my bigger foot) is almost an inch longer than the one I made for my right foot. It really is too big, I didn’t think so at the time, but it really is. I’m not sure I got the heights right either, but I think they work well together. Looking at these socks, they are two different colors, but I SWEAR, they are made from the same skein of yarn. I think they would have come out a bit tighter on my foot had I gone with a size 1 needle, but I wasn’t really sure, even after I made my gauge swatch. 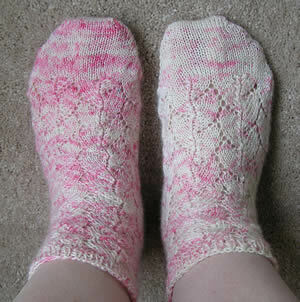 If I ever made another pair of socks, I would definitely make both socks like the one I made for my right foot. It fits really nicely, even after blocking. Yes, I know, I blocked. You had too in order to get a gold medal. So, I blocked. I even put them in the dryer for awhile, they didn’t shrink at all (I was kinda hoping the left one would). Here it is 5:30 pm, and the closing ceremonies start at 7:00 pm. I’m really proud of myself. I made a pair of socks, something I never thought I would do. I worked with size two needles, something I may never do again. And, I worked in a lace pattern, something that is also difficult for me. It’s a good day. Wow, size 2 needles… They are so tiny, you must have had a lot of patience! those socks are SO cute! I wish I knew how to knit them They are beautiful! Your socks are beautiful. Congrats! I’m almost encouraged to knit some myself. Gwen! I did these same socks at the same time!!! I blogged them here….